The S&P 500 should is a good buy. China and US trade negotiations resemble MAD-Mutually Assured Destruction, so a likely outcome is positive, though the market is panicked. MLPs are a great buy. High yield, restructured balance sheets, strong oil and gas production growth and out-of-favor. The fourth quarter spike in equity market volatility is primarily the result of the US-China trade negotiations during a multi-year interest rate normalization program designed to reverse the unprecedented central bank accommodation from 2008 to 2016. In addition, secondary factors including slowing foreign economies, Brexit, the US Government shutdown and an overly tight Federal Reserve have created a volatility event in December which High Frequency Traders1 "HFT" have exacerbated resulting in a financial panic. The US equity markets began the year in a similarly volatile fashion with rising interest rates prompting a dramatic February equity market rout. The early 2018 stock market pullback was slowly reversed by higher earnings from lower corporate taxes, before the fourth quarter’s 14% decline. The exceptionally sharp fourth quarter decline is a “volatility event” where technical [read-computer driven and HFT] factors amplify temporary fears which will prove immaterial to the markets’ health six months later. We do not expect the US slipping into a recession, a trade war with China, excessive tightening by the Federal Reserve, Brexit or the US government shutdown to meaningfully impact global growth. If the US-China trade relationship is restructured to stop China’s intellectual property theft and forced technology transfers, the results will stimulate global growth and cause global markets to rebound. President Trump and President Xi’s G-20 summit resulted in an agreement to halt additional tariff increases and work toward a more permanent trade deal over the next 90 days ending March 2. Equity markets will continue to consolidate and rebound as these negotiations move toward settlement. We believe that the world’s two largest countries understand that it is in their mutual best interest to resolve their dispute. This uncomfortable perspective is based on the more frightening precedent of Mutually Assured Destruction "MAD" which has kept the United States and Russia from using nuclear arms to destroy each other. In both cases, failure to resolve differences would be so disastrous that a resolution is imperative. The table below shows the S&P 500 earnings yield is 6.86% and the 10-year Treasury note yields 2.736%, reflecting a higher earnings yield for stocks than bonds. 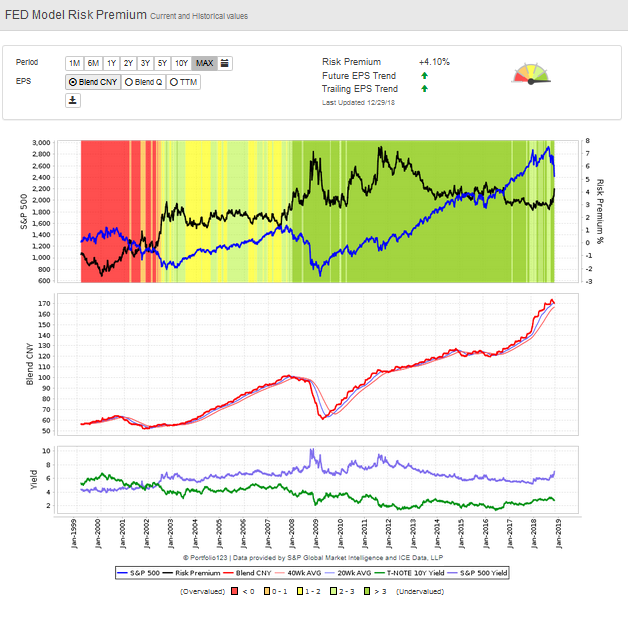 The Fed Model’s Risk Premium2 is quite attractive at 4.1%. Further, the S&P 500 PE is 15.45 times 2018 S&P 500 earnings and 14.24 times 2019 earnings. According to Jeremy Seigel, for the last 65 years the S&P 500 has traded at an average trailing multiple of 17 with much higher interest rates. 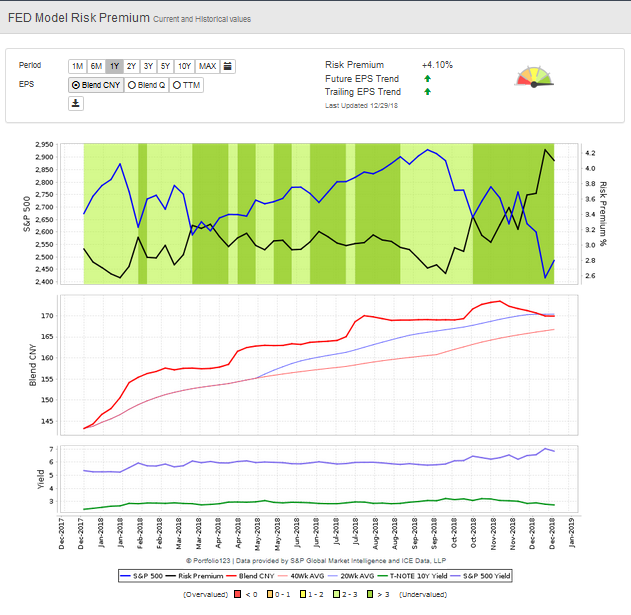 The longer-term FED Model Risk Premium chart below shows earnings rising throughout 2018 while the stock market has been consolidating those gains. Below the S&P 500’s earnings yield (6.83%) exceeds the 10-year Treasury Note yield (2.73%) by 4.1%--“The Risk Premium”. The Risk Premium is in the upper half of its 20-year range, and the only real risk would be if earnings turn down like they did in 2008. The one-year chart below shows the risk premium rising rapidly in the top graph as the earnings yield rose with declining stock prices and interest rates declined as shown in the bottom graph. The chart below of the VIX Index shows that volatility has spiked to the highs of earlier this year and appears to be in retreat. Since volatility spikes reflect a disproportionate investment in put options, it is a useful objective measure of panic, which historically marks an attractive entry point for investors. Of course, we assume that economic conditions are not about to meaningfully deteriorate. The long-term chart of volatility below shows that the current spike is in the upper range of volatility levels suggesting this was among the larger spikes in the last three decades. We believe the current volatility spike, like volatility events in 1990, 1998, 2010 and 2011, can be bought because the worrisome news of the day will prove a non-event in six months. Because the return profile of MLPs historically is the sum of the current distribution yield plus the distribution growth rate, by adding the current 9.21% yield plus a distribution growth rate of 4.5%, we forecast expected returns in the 13.7% range. There has been four years of MLP underperformance compared to the S&P 500, but now the fundamental case for MLPs again appears solid. However, for those worried about a major stock market top following a ten-year bull market in stocks, there is another compelling argument for MLPs. Historically, MLPs have been negatively correlated to the major indexes when MLPs operating fundamentals are positive and the S&P 500 is in a bear market. This is because momentum money reallocates into safe havens like bonds and high yielding securities like MLPs, when capital gains are no longer easily found in index investing. The table below shows when the 2000 technology and stock market bubble matured and reversed, MLPs were inversely correlated to the S&P 500 and NASDAQ. In 1998 and 1999, total returns for the S&P 500 rose 28.8% and 20.5% and the NASDAQ rose 39.6% and 85.6%, respectively. MLPs’ total returns were -3.0% and -7.8%, respectively. When the stock market peaked and collapsed in 2000, 2001 and 2002 the S&P 500 and NASDAQ declined 9.8%, 11.8% and 21.7% and 39.2%, 21.1% and 31.53%, respectively. In sharp contrast, MLPs’ total returns rose 45.7%, 43.7% and 3.36%, providing a rewarding hedge and return in that post bubble market. The chart below shows that in 2017 and 2018, MLPs were underperforming while the S&P 500 and NASDAQ were topping. Like the 2000 peak, the MLP sector is in good fundamental shape while prospects for the S&P 500 and NASDAQ appear less certain. While we remain sanguine about the S&P 500 and NASDAQ, we cannot be certain that the major indices will continue their bull markets. By contrast, it appears the MLP sector has made a cyclical bottom and at a minimum should see strength simply by virtue of their outsized yields. As such, adding to MLPs as a total return and hedging investment is sensible. We have been buying Kayne Anderson MLP/Midstream Investment Company (KYN) a closed end MLP fund managed by Kayne Anderson. KYN 11.3% yield combined with a diversified portfolio of high quality MLPs is an attractive vehicle for MLP investors. While we remain deeply troubled by American Midstream’s distribution cut and subsequent behavior by its General Partner (American Midstream GP, LLC) and ArcLight Capital, American Midstream Partners (AMID) just sold its refined products terminal and continues to de-lever its balance sheet. Further, its December 31 announcement of a debt covenant amendment cutting the 4th quarter distribution to zero until the “Consolidated Total Leverage Ratio” is less than 5.00:1.00 only accelerates the company’s balance sheet repair. With ArcLight buying stock and bidding $6.10 a share, tax loss selling abating, renewed panicked investor selling from its curiously timed December 31 temporary distribution cut and AMID’s closing price of $2.99/share, a return on the order of 100% could be achieved in the coming 6-9 months. Clients have lost badly believing AMID CEO Lynn Bourdon’s commentary3 and its shares are down 75% in 2018. More disturbing is ArcLight’s bid following the July distribution cut, AMID’s unwillingness to take quarterly conference call questions or even have a conference call to explain AMID’s 75% distribution cut and new business strategy, when MLP investors are typically retired fixed income investors not focused on carefully reading regulatory disclosures. So while we agree with Recurrent Advisors’4 and our clients’ disgust with management’s behavior, we believe AMID's units are significantly undervalued and precisely why ArcLight is buying AMID. Hopefully, the New Year will bring greater regulatory and ESG5 focus to MLP transactions like this and HFT exemptions which appear to hurt the public investors while rewarding the most sophisticated and wealthy Wall Street investors. The Risk Premium is the measure by which the S&P 500 earnings yield exceeds the 10-year US treasury note yield. Its 4.1% yield suggests the market is paying markets a robust premium to buy stocks and that they are an especially attractive risk compared to 10-year US Treasury bond notes. CEO Lynn Bourdon November 8 2017 AMID stock closed $13.15/unit. “Quite frankly folks, this train is leaving the station. I hope as investors, you are as excited as we are about our future and if you stay with us or you get on board quick, because we have an exciting and successful journey ahead of us, and we're not waiting around.” CEO Lynn Bourdon November 8, 2017 AMID stock closed $13.15/unit. As reported on October 10, 2018 by Bloomberg’s Rachel Adams-Heard, AMID and ArcLight’s actions appear self-interested and “egregious”. Disclosure: I am/we are long AMID KYN. I wrote this article myself, and it expresses my own opinions. I am not receiving compensation for it. I have no business relationship with any company whose stock is mentioned in this article.